The Stenographers’ Equal Suffrage league held a social session Saturday evening at the home of the president, Mrs. E. O. Gardner, 370 Vista street, with a large attendance. Mrs. A. C. Newell, president of the Civic Progress circles, addressed the league, telling the members of the advantages to be derived from forming circles for the study of civics and citizenship. Mrs. Weathered also spoke, mentioning some of the things that have been accomplished by the women of Washington since they have had suffrage. Refreshments were served at the close of the meeting. Writing from Grants Pass, Bess Gunnison Conklin tells of the splendid progress which is being made there, and in nearby sections. She sends an urgent request of more literature. A moving picture and a sentiment for suffrage is being used by the local moving picture show at that place. In Ashland successful rallies are being held. At Rogue River a luncheon, followed by speeches on suffrage, was held. Suffrage was introduced at the last meeting of the Pomona county grange. Reports from Medford are good, concludes Mrs. Conklin. Letters are being received at the club compaign (sic.) committee headquarters from Kansas suffragists, who are making inquiry concerning Rev. Clarence True Wilson, formerly of this city, who is now in Kansas lecturing and debating against suffrage, being employed by the anti-suffrage organizations of that state. Learning that Mr. Wilson is formerly of Portland, the Kansas women are writing for more information concerning him and his record here. Mrs. Mary Tubbs of Yreka, Cal., who is spending some time in Oregon, lectured at Klamath Falls, Friday evening, on the advantages of suffrage in California. 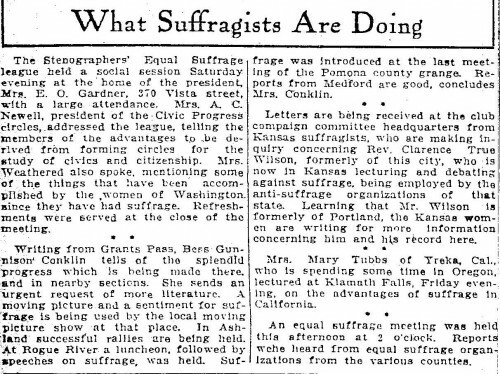 An equal suffrage meeting was held this afternoon at 2 o’clock. Reports wehe (sic.) 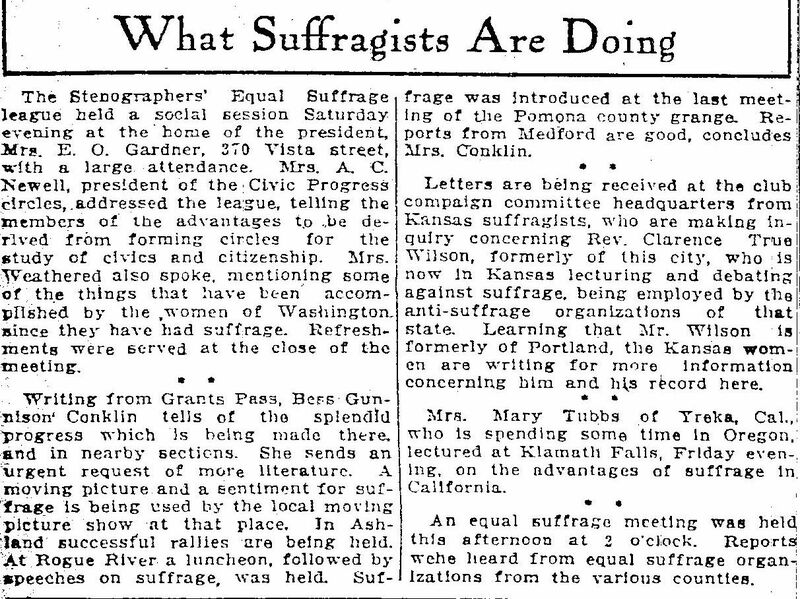 heard equal suffrage organizations from the various counties.